Amsterdam hospitality group IQ Creative has been busy of late, recently opening three new venues simultaneously in the historic Odeon building, constructed on the Singel canal in 1662. 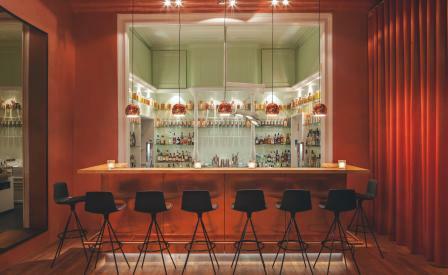 While their flagship venue Supperclub is looking sleek in what is an undeniably grand new space, our pick of the three - alongside Hoppa - is Apt, a moody nighttime drinking den purveying whiskey, cocktails, jazz and decorative oddities. Pronounced as in the letters A.P.T, Amsterdam design studio Concrete has given the venue two distinctive treatments. At one end, oxidised copper surfaces, red drapes, hospital green tiles and warm spot lighting create a bar area with a rich and theatric glow. The second, a cocktail lounge meets eccentric living room, comes with a curious twist – ninety degrees, to be exact. Think wall finishes (artworks on canvas) that are hung on the ceiling, a wall covered in pressed metal ceiling tiles, and another lined with timber flooring and Persian rug. It surprisingly works, and, given its open until 4am seven days a week, it’s a twist that might make even more sense if slouching sideways after a couple too many cocktails.